Born in Buenos Aires, Argentina, Sylvia Kersenbaum began her musical training with her mother. Soon afterward, she became a pupil of the eminent teacher, Vincent Scaramuzza. Kersenbaum holds degrees in performance, pedagogy, and composition from the National Conservatory in Buenos Aires and Artists Diplomas from both the Academy of Santa Cecilia in Rome and the Academia Chigiana, Siena. She has appeared in recitals and as soloist with orchestras throughout Europe, the Far East, and North and South America. Noted orchestras include the London Symphony, Royal Philharmonic, Munchen Philharmoniker, Bayerische Staatskapelle, Orchestre de la Suisse Romande, the San Francisco Symphony, and the Louisville Orchestra, and with conductors Wolfgang Sawallisch, Jean Martinon, Gunter Herbig, Leopold Hager, Garcia Navarro and Lawrence Leighton Smith. Kersenbaum’s recordings for the EMI-Angel label have won major international press acclaim. Her version of Tchaikovsky’s Concerto Op. 44 under Jean Martinon was reissued on CD Sg EMI Europe, and Liszt Hexameron included her in their series 100 Virtuosi of the 20th Century. As a composer, Kersenbaum wrote two suites for “a cappella” choir, a cantata for soprano, tenor, choir and orchestra, and the music for Edgar Allan Poe’s, “The Masque of the Red Death“, which premiered as a ballet in October 2001 at the Capitol Theatre (Bowling Green) in collaboration with the WKU Department of Theatre and Dance. 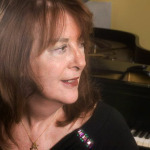 Kersenbaum has been a professor of piano at Western Kentucky University in Bowling Green since 1976. Her performances of Beethoven’s thirty-two piano sonatas on campus and abroad were highly acclaimed. In 1990 she was awarded Honorary Membership of the American Beethoven Society and the WKU Faculty Award for Research and Creativity. 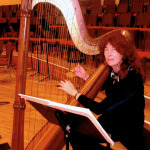 During her time at WKU, Kersenbaum collaborated on many occasions over two decades with the opera theatre programs and as harpist with The Symphony. She was invited to present Masterclasses at Belmont University (Nashville), Northwestern University (Chicago), University of Louisville, University of Massachusetts (Amherst) and the Beethoven Conservatory in Buenos Aires. In 2002 the WKU student fraternity Delta Omicron established a scholarship in her name, which was first awarded in 2005. Recipients of the Kersenbaum scholarship have been Jessica Carmichael (’05-’06), Rachel Norton (’07), Rachel Stewart (’07), Aleshia Akin (’08), Melissa Gensler (’09), Ellen Murray (’10) and Kathryn Aquadro (‘11). Sylvia Kersenbaum is Profesor Emerita from Western Kentucky University.